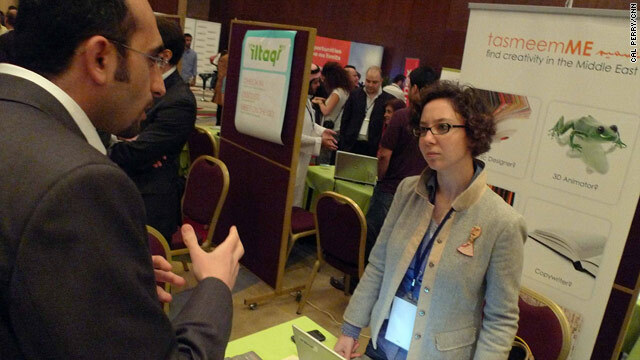 Noor El Fadl (right) was inspired at the ArabNet conference and she "could not have asked for more exposure." Beirut, Lebanon (CNN) -- Nour El Fadl, a 28-year-old living in Amman, Jordan, had been sending out, "online fliers" promoting her new company -- one that was born in many ways out of frustration. Like so many, Nour was having trouble finding work so the freelance graphic designer turned her focus, time and attention to a systemic problem across the Middle East. She created a Web site for people just like her, folks who don't have a way to connect to bigger businesses and find work in the Middle East. While circulating her fliers she was contacted by a group she had never heard of -- ArabNet. The group's leader was contacting her because he is interested in reshaping the Middle East as well: a place where many believe business could do more than just thrive. Connectivity is not the same in the Middle East as it is in Europe and the West. In many ways this region is lagging behind when it comes to e-commerce. Thus, an "ArabNet" conference. The idea of the conference is simple enough. Take 10 young "upstart" companies and put them in a room with powerhouse companies like Google and Microsoft. Provide a way for the upcoming business leaders to exchange ideas and debate with those that currently define this region's economic successes. You'd better bet on this place ... or you're going to miss the boat. The conference is the first of its kind in the Middle East. Dozens of major Internet companies, sponsors, and regional leaders all gathered in one place. An open forum of speeches, presentations and a single running theme: how to bring the Middle East front and center as an economic powerhouse. Nour didn't think twice about hopping on a flight to Beirut, Lebanon, to present the idea of her company to some of the most important business leaders in the world. She was educated in Beirut and is no stranger to the city. Neither is Fadi Ghandour, but unlike Nour he is a business giant. He's the CEO and founder of Aramex which, among other things was the first ever Arab-owned and run company to be traded on the NASDAQ. He has the ear of world leaders from the king of Jordan to the U.S. president, and he'll be in Washington soon speaking at another conference geared towards furthering the region: this one organized by Barack Obama. When he speaks, people listen -- and he is not one to mince words. He's critical towards anything he believes is slowing down the Arab world from being everything he believes it can be. He gave a rousing speech to the crowd on the first day of the conference. The speech like the conference itself streamed live over the Internet. Listening to every word was Nour. About to make her presentation for her business to industry leaders ... she was nervous. More than 500 people were packed into a hall -- many of them "tweeting" and not all of them being kind -- and tens of thousands of people watching online. "I thought it was great that he spoke before us," she told me. "He made us less anxious and less scared." The beauty of this conference is access. Access to people like Ghandour -- someone with decades of experience. "It's great that he pushed people to help start-ups (in his speech). Finally someone is standing up for the underdogs." Ghandour does more than that when you speak to him one on one. He sees endless business opportunities that are being missed because of institutional problems across the region. "The enabling environment has to be kick-started by government, the ease of registration, the ease of crossing borders as human beings, which is a massive headache for us in the Arab world. As you know," he tells me, "the issue of visas, the issue of movement of goods and the ease of movement of goods along our borders ... we talk a lot about the great Arab common market, but where is it?" There are times when Ghandour speaks with such candor it brings smiles to the faces around him. He says what so many in this part of the world think but will not say. "You know people want to live in an ecosystem of freedom of movements, freedom of expression, freedom of existence, rule of law. This is what keeps people here, this is the reality of the Middle East and we need to acknowledge that. "Some people may not like what I'm saying but believe me every single Arab behind closed doors, when he is not allowed to speak in the front door, he will tell you: I want rule of law, I want to be protected for my property, I want to exercise my existence without anybody interfering with me, and for the government to be the enabling." As Ghandour continued a small crowd gathered. "There is nothing scary about that. That's what empowers the youth, that's what keeps the youth believing in this -- in the Arab world -- and believe me a lot of Arab expatriates who live in the West want to come back. "But when they come back we need to make sure that they are coming and they're staying because there's a heck of a lot attraction for the region. This region is on the verge of going places as you can see from this conference." The region may very well be on the verge of shedding the global public image that it so loathes: being viewed as a place filled with violence, rather than a place that could potentially help bring the world out of its current economic woes. Certainly Nour believes anything is possible. She told me: "The exposure was just insane. I could not have asked for more exposure. I would not have gotten in years what I got in two days. I think this will really push the site forward"
If people like Ghandour have their way: one day she'll end up a global business giant like he is. Before he left Ghandour remarked: "You'd better bet on this place ... or you're going to miss the boat."